I spent this past weekend in New York. To be quite frank; I don’t usually enjoy my time spent there. In the Big Apple people don’t say “good morning” when you make eye-contact with them on the train on the way to work like they do here in DC. But since I am such a fashion maven, when I grace the city that never sleeps with my presence, I mentally convince myself that I can make it there; because as they say if you can make it there you can make it anywhere. So between hailing cabs, getting on the wrong train and walking endless avenues; I try to sandwich in as many audiences as possible with my fashionable friends. “Fashion starts with fashionable people“. This is the belief on which legendary American fashion designer Halston built his iconic label. Roslyn Johnson is truly one of the most fashionable people I know. She and I met at a program in college and we were both wearing well-tailored suits. Her first words to me as she clutched my arm and whispered in my ear were “Thats a Benneton suit; I can tell”. She and I may not see each other very often but when we do; we unload. Everything from gossip, to men, to work; we play a game of catch-up that usually leaves me exhausted and inspired. We met for Sunday brunch at Amy Ruth’s in Harlem. Over a meal of fried catfish and baked macaroni and cheese we updated each other on our lives. She’s in love (while I am still searching) and she is learning a lot as Assistant Outerwear Buyer for Saks Fifth Avenue. The last time we were together in New York was a little over two years ago and Ros had just moved to the city without a job and was trying to make her way in the fashion capital of the world. When we she asked me whats new; I told her about this blog and the clothing line I am working on. Ros shared with me that she’s also working on a line. Its called Inkwell and like Ralph Lauren it’s based on classic all American values; the difference is Inkwell is based on Black American values. The Inkwell is a part of the beach on Martha’s Vineyard where well-to-do African-Americans have vacationed since the early 1900s. 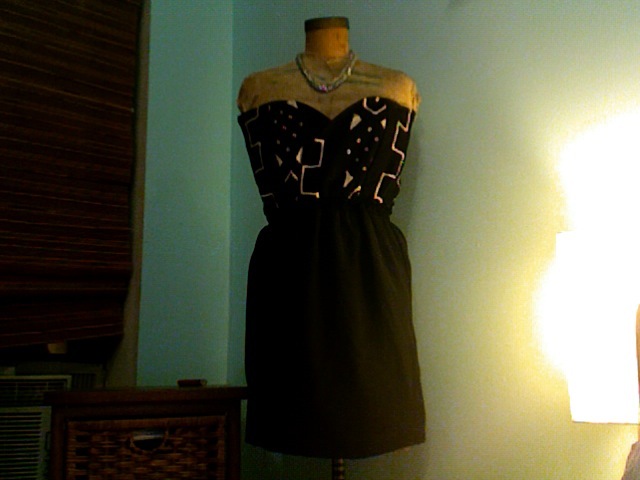 Inkwell, like my line, is in its early stages and its first finished piece is a black and white strapless cocktail dress. The bodice is made of hand woven and hand dyed West African mud cloth. I am really proud of Roslyn and happy that we can share this journey together. We are two fashionable girls making our contribution to this world of ours; look out for more to come from her. two lines I’ll be checking for…love the print on bodice!